My first garden party of the summer was in aid of a good friend’s thirtieth birthday party and had a ’round the world’ theme (i went as Willy Fogg by the way and came second in the fancy dress contest – thanks Mr & Mrs Cooke!). I was asked if I could provide one or two drinks for the occasion that could be easily scaled up and served to a group of around forty people. Happy to oblige I combined a classic Barbadian rhyme* and some typically English ingredients to create a summer punch which was duly christened ‘Strawberry Fields’. Muddle a few leaves of mint and one strawberry (per serving) in the bottom of a mixing glass. 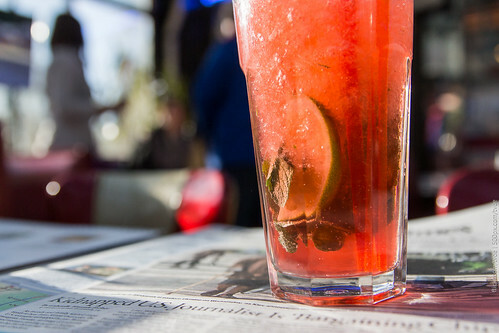 Add four parts cold Earl Grey tea, three parts gin, two parts strawberry syrup and one part freshly squeezed lime juice. Strain into a highball glass and garnish with a strawberry. * The rhyme in case you were wondering is the old Bajan basis for a traditional rum punch “one of sour, two of sweet, three of strong, four of weak”. For the rum punch it refers to lime juice, sugar, rum and water in that order (served with a dash or two of Angostura bitters and nutmeg, which don’t make the rhyme) but can easily be transposed to a whole range of other ingredients.